What's a good program to batch resize 100,000 jpg images? The program should run in batch mode to resize all files in a folder and then save new files to different folder. An option for setting jpg quality would be great, too. 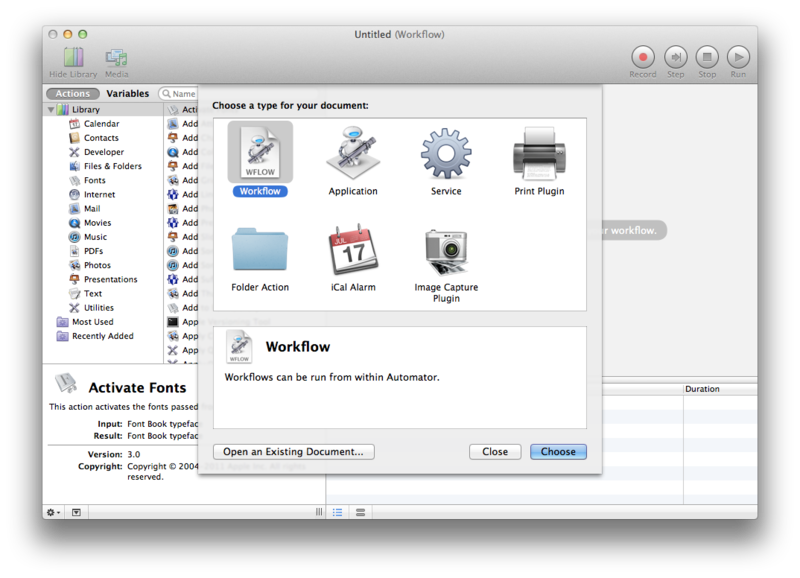 First, open Automator, which is in your Applications folder. ask you how big you want the resized copies to be. You'll be able to choose either a fixed size or a percentage. All the images will be resized to either that size or by that percentage. Once you do that, Automator is going to churn and burn, and when it's done it'll beep at you. Unfortunately, it doesn't seem to have an option to choose JPEG quality. However, for the price (free), it's pretty dang convenient. I like to use ImageMagick. sips and Automator (which use an identical resizing method) make images look too blurry without additional sharpening in my opinion. 500x500> makes images wider or taller than 500px fit to 500x500px. 500x would always change the width to 500 px and 500x500^ would make all images at least 500x500px. -path /tmp/ saves the output files to /tmp/ instead of modifying files in place. Lanczos2 or the 2-lobe Lanczos is very similar to Catrom. Compared to Lanczos (Lanczos3), they are slightly less sharp, produce less ringing artifacts, and produce more Moiré patterns. The default filter for making images smaller is Triangle, which often makes images too blurry in my opinion. -quality 100 creates files about twice as big -quality 95, which creates files about twice as big as -quality 88. -Z 500 is like 500x500> in ImageMagick. Preview used to use the same resizing method as sips and Automator, but it has used a different one since 10.7. I prefer ImageMagick's Lanczos2 though. I uploaded a comparison of the different options to http://19a5b0.s3-website-us-west-2.amazonaws.com/imagemagick-osx-resizing/index.html. ImageMagick is a command line interface program and made for this purpose. The use and installation of ImageMagick can intimidating, but this image manipulation package is the most powerfull I have encountered so far. As the installation from source can be a hassle for native OS X users I advise you to use Homebrew. Homebrew is now installed, it is wise to follow the installer's suggestions after installation. Now we install ImageMagick using brew. To answer your question "How to resize all files in a folder and save them in a different folder" you can run the following script. ImageMagick can convert over 100 different image formats, and almost all tricks you can do with Photoshop you can do with ImageMagick. where you replace the 800x600 by whatever size you want. Advantages include a great amount of flexibility in ImageMagick's convert, such as the ability to select different quality settings for the target image, or setting the resize option by percentages. Or you can use -geometry 800x800, in which case the aspect ratio will be preserved, but the maximum of the width and height will be 800 pixels. Disadvantages are the obvious ones: It requires a certain familiarity with the command line, plus a willingness to plough through the command line options of convert for the settings you want. This is not a task for the faint of heart. I second GraphicConverter. I've been a registered user for 16 years. Its main purpose is batch-processing image editing, and it has a good user interface for designing custom workflows and saving them. 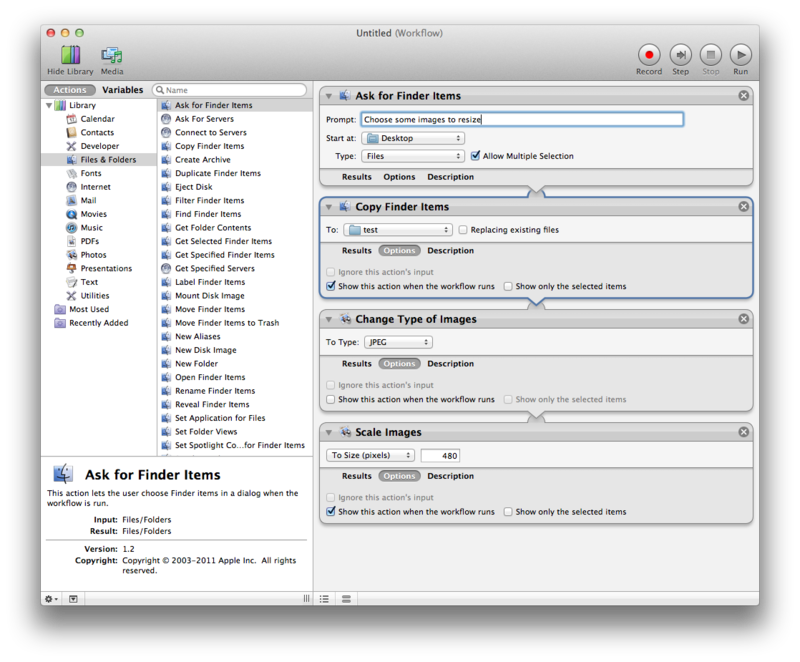 You can also use it in conjunction with Automator, but you probably won't need to. 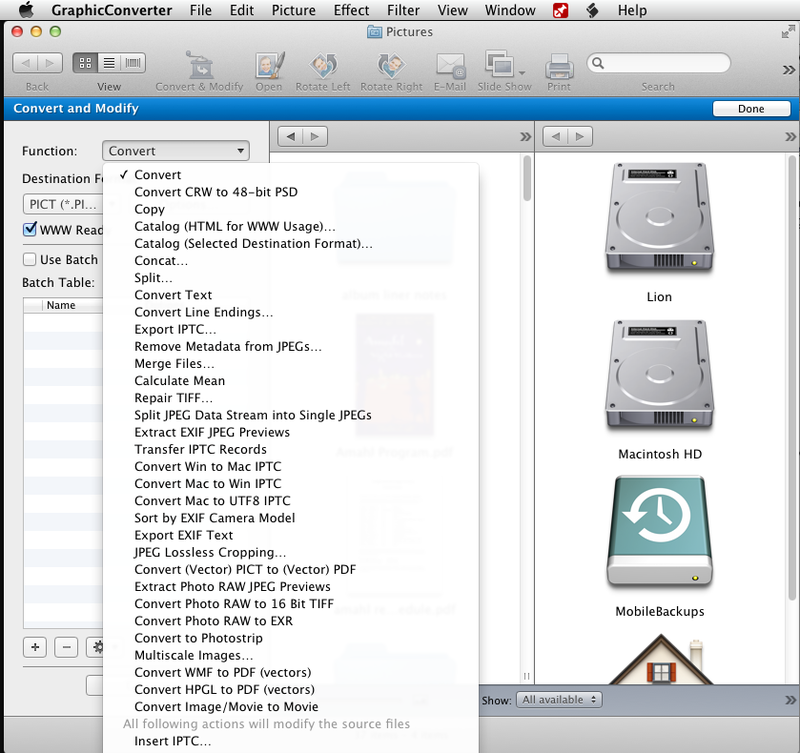 Here is some information from GraphicConverter's page explaining their batch processing image editing functions. During the conversion process you can apply up to 60 additional batch functions such as rotation, resize, change the resolution, etc. This is yet another simple, clean and effective batch image resize script. If you are dealing with graphics and different resolutions a lot, you can use this script and save it with different values for occasional uses. Do so, by changing this target_width 120 value to your needs and save the script. 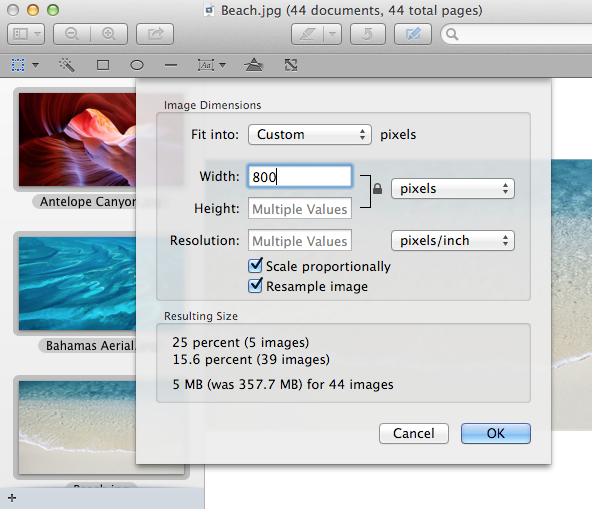 Now drag your image(s) onto the saved script-file to start resizing your image(s). I usually import all of the pictures into iPhoto and then export them to the different sizes. I have done it on batches of 300 or so images, but never on the scale you are wanting. Still, it may be an option. No one has mentioned Apple Aperture. But unless you need the other things Aperture gives you, I second both the ImageMagick approach -- if you're not intimidated by downloading, installing, and running command-line programs, and the Automator approach, which despite @markhunte's claim, is free. I use wine (and XQuartz) and IrfanView. Of course you could also use imagemagick from the command-line. For wine and imagemagick I would recommend Homebrew. Not the answer you're looking for? Browse other questions tagged software-recommendation image-editing . Is there an app that quickly makes an image of selected text? What's a good program for syncing files between computers?